CHC is celebrating Give Kids a Smile Day and National Children’s Dental Health Month at sites around Connecticut this month! Yesterday, our site in Stamford hosted an event and it was a huge success! Below is an email to the Community Health Center, Inc. from someone who attended to event. I wanted to write a quick note thanking you and CHC for the wonderful event you organized yesterday at Franklin Common — a free dental clinic for our children. It was a HUGE success. I understand that as a result of this initiative 46 children today have brighter smiles. That’s amazing! We look forward to working closely together on other initiatives such as education about childhood vaccination in the future. A huge thank you to everyone who supported our Give Kids a Smile events throughout the month of February. What an incredible showing of team work and committment to the uninsured patients in our communities. Events were organized at the following CHC sites: New Britain, Meriden, Old Saybrook, Norwalk, Stamford, New London, Waterbury & Middletown. Middletown, CT-February 17, 2014: For the past twelve years, organizations in Connecticut from public and private foundations have come together to create an oral health awareness movement. The American Dental Association (ADA) began the Give Kids a Smile (GKAS) program in 2002 as a way for ADA members to join with others in the community to provide dental services to underserved children. Eleven years ago the Community Health Center, Inc. (CHC) became one of the participants of Give Kid’s a Smile Day to help target the underserved populations among their regular patient demographic. Each year, approximately 450,000 children benefit from more than 1500 Give Kids Smile events in the US. According to the U.S. Centers for Disease Control and Prevention, early childhood cavities are the most common chronic disease in children and although noteworthy improvements have been made in the past decade, oral health significance is still being overlooked. One major way CHC has helped increase children’s access to oral health services is through the mobile dental program which brings dental services directly to over 170 CT Schools. Mobile Dental services have been funded through different Connecticut Health Foundation grants which work to support the integration of oral health at every point where children and their families intersect with health care, human service and education systems. 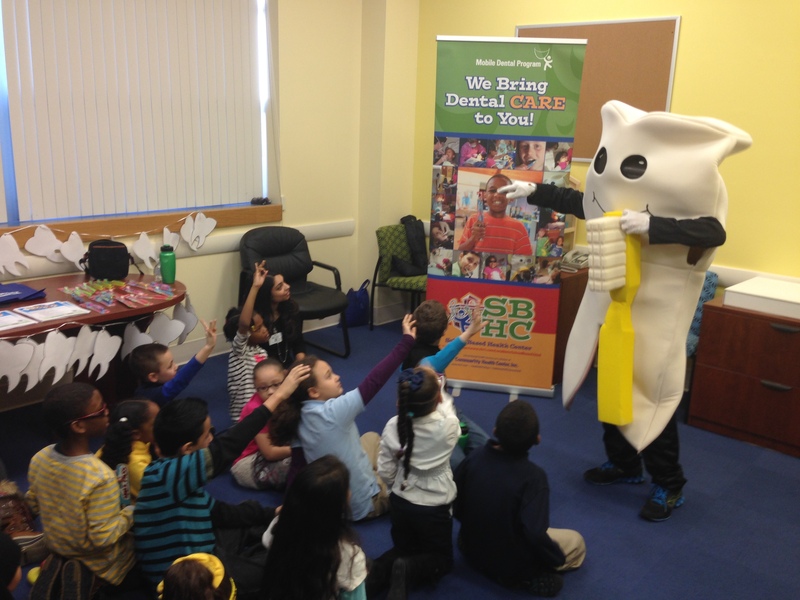 Once again this year, CHC participated in the American Dental Association’s 12th annual Give Kids A Smile Day (GKASD) on Friday, February 7th with a kickoff event at Smalley Academy in New Britain. The event involved students from the New Britain elementary school listening to Mayor Erin Stewart give a proclamation along with CHC leadership staff who added encouraging words in the School Based Health Center office. “Our goal is to have oral health completely integrated into a family’s concept of health and wellness,” stated Yvette Highsmith Francis, the CHC Director of Hartford & New Haven County sites. The Community Health Center, Inc. organized various GKAS events during this past month in their New Britain, Meriden, Old Saybrook, Norwalk, Stamford, New London, Waterbury & Middletown sites along with other private dentists across the state who offered free cleanings, exams, sealants, fillings, fluoride treatments and dental education to children with HUSKY insurance or no dental insurance. Give Kids A Smile activities raises awareness for policy makers and stakeholders about the ongoing challenges that low-income families face in finding dental care. The events are free and open to all children without a regular dental home. “It’s a great opportunity for the kids to learn brushing techniques and habits along with what foods and drinks to avoid. Parents also have a chance to learn about our Mobile Dental Program that comes directly into the child’s school, providing dental cleanings, sealants and in some cases restorative work,” said Mobile Dental Coordinator, Justin Gooley. For more information about the Mobile Dental Program at CHC please call (860)224-3642 ext. 5163 or email [email protected] . World Cancer Day – Debunk the Myths!